Obituary for William G. Clark | Wyman-Fisher Funeral Home Inc.
William George Clark (86) long-time resident of Pearl River, NY, died Wednesday, April 10, 2019. Born in North Providence, Rhode Island, to William Sylvester Clark and Josephine Andrews Clark, Bill was then raised in the Bronx where he attended Rice High School. In 1963 he married Mary Sozio at St. Andrew R.C.Church in Westwood, NJ and has lived in Pearl River since. Bill is survived by his wife, Mary, two sons, Billy (Karen) and Kenny. He is also survived by three grandchildren, Billy, Amanda and Joanna. Bill proudly served in the United States Navy, as a Radioman, from 1956-1960 during the "Cold War" aboard the USS Manley DD940 and the USS Gainard DD706. 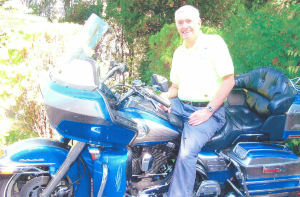 He was a 3rd degree Knights of Columbus, the Post Adjutant for VFW Post 7370, a lifetime member of the American Motorcyclist Association and served in the Pearl River Alumni Ambulance Corps for several years. Bill worked for Lederle Labs (Pfizer) from 1950-1993 as well as drove a school bus for several years. He loved riding his Harley Davidson motorcycle and attended all the motorcycle runs and rallies with his wife Mary. All who knew him will miss his optimistic and happy outlook. A Mass of Christian burial will be held on Monday, April 15th, 11:30AM at St. Margaret of Antioch R.C.Church, 115 West Central Ave., Pearl River. Burial will follow at St. Anthony Cemetery, Nanuet, NY. Visiting will be held Sunday, April 14th, from 3 to 5 and 7 to 9 PM at Wyman-Fisher Funeral Home Inc. In lieu of flowers, donations can be made in Bill's memory to United Hospice of Rockland, 11 Stokum Lane, New City, NY 10956.